Looking for the perfect Father’s Day gift for the special man in your life? With over 100 shops at The Liberty, we’re bursting with ideas so you need look no further! Plus, tell us here why your dad is the best for a chance to win a £100 shopping spree for him plus a £50 gift voucher for you! 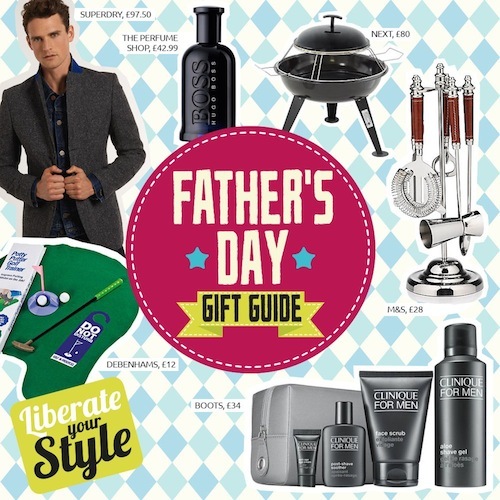 If your dad likes to show off, then cocktail accessories will go a long way this Father’s Day! With everything the contemporary bar needs, this Hanging Bar Set (£28) from M&S is perfect for the aspiring or expert mixologist. Treat your Dad to this quintessential Father’s Day gift. This single-breasted Town Blazer Jacket (£97.50) from Superdry, features contrast under collar, two colour lining and an internal tech pocket specially crafted for earphones – the perfect mixture of practical and stylish for tech-savvy dads! If you have a well-groomed Dad, treat him to two or more Clinique for Men products from Boots, and he’ll also receive a generous free gift packed with male grooming goodies (while stocks last). If your Dad loves his boys toys, inject a little fun into your gift giving with a huge range of novelty toys from Debenhams, including this Potty Putter Golf Trainer (£12). This 3-in-1 Pizza Fire Pit (£80) from Next, is a multifunction wood burning fire pit which allows dad to create BBQ style food or authentic pizzas…because every dad loves burning food! If you’re still struggling for inspiration, give the gift of choice with a Liberty Gift Card, redeemable at any of our retailers and available at the customer service desk.